is an emerging global clean-technology cluster and special economic zone located in what aims to be one of the world’s most sustainable urban development’s powered by renewable energy. It is a city where current and future technologies will be funded, researched, developed, tested and commercialised. Leading multinational companies in the cleantech sector, as well as small- and medium sized enterprises and entrepreneurial start-ups will locate sales and marketing offices, demonstration centres, research and development labs and headquarters in the city. The city is anchored by the Masdar Institute of Science and Technology - a graduate-level, research-driven institution that is collaborating with the Massachusetts Institute of Technology (MIT) to develop and offer courses focused on education and research in advanced energy solution, sustainable technologies and policy. A great place in which to live, Masdar City will be home to residents and commuters who will live the technological innovations being developed in the city’s labs, research centres and demonstration showcases. A test bed for new approaches to the planning, design, engineering, construction and operational challenges involved in creating environmentally sustainable cities, Masdar City itself will be helping test and solve these problems, thereby making it easier and cheaper to develop sustainable cities in the future. This US$22 billion free zone located about 17km from downtown Abu Dhabi will eventually be home to companies, researchers, and academics from across the globe, creating an international hub for companies and organisations focused on renewable energy and clean technologies. It is an extraordinary endeavour that will attract the highest levels of international expertise, academics, commerce and residents - creating an unmatched commercial platform for sales, marketing and demonstration, as well as an environment ripe for innovation. By bringing together such resources, Masdar City will set a benchmark that will ultimately support sustainable development throughout Abu Dhabi and the region, as well as provide a functioning blueprint for sustainable living around the world. Construction began in 2008, and just two years later, the first buildings are scheduled to open in the third quarter of 2010. The city will be home to international corporations and leading minds in the field of sustainability and renewable energy. 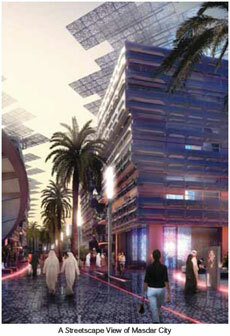 General Electric is a strategic partner in Masdar City and will build its first Ecomagination Centre in the city. The centre will focus on promoting sustainable business solutions that will support the development and deployment of new and innovative technologies. The overarching Masdar-General Electric agreement focuses on sustainable business solutions and forming a broader R&D relationship that will support the development and deployment of new and innovative technologies and the overarching function of the city as a cleantech cluster. Businesses are able to take advantage of a home grown research and development centre, the Masdar Institute, the first graduate-level academic institution dedicated to the research of alternative energy, environmental technologies and sustainability. While clean technology is the driving force behind the cluster, Masdar City caters to a range of technology companies contributing to the field. 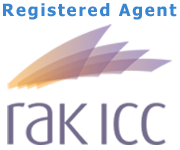 The city provides its commercial population with a unique business environment that fosters innovation and provides a convenient gateway to enter the growing Gulf market, wider Middle East and nearby Asia. Masdar City, designed by renowned planning and architecture firm Foster + Partners, will be built on six square kilometres near to Abu Dhabi International Airport and not far from Saadiyat and Yas islands. Inspired by the architecture and urban planning of traditional Arab cities, Masdar City incorporates narrow streets; the shading of windows, exterior walls and walkways; thick-walled buildings; courtyards and wind towers; vegetation and a generally walkable city. Carefully planned landscape and water features will aid in reducing ambient temperatures, while enhancing the quality of the street; the elimination of cars and trucks at street level not only makes the air cleaner for pedestrians but also allows buildings to be closer together, providing more shade but allowing maximum natural light. The placement of residential, recreational, civic, leisure, retail, commercial and light industrial areas across the master plan, along with the public transportation networks, ensures that the city is pedestrian friendly and a pleasant and convenient place in which to live and work. In light of these design elements and many others, Masdar City has received several awards, including the first World Clean Energy Award in 2007 from the Transatlantic21 Association in Basel, Switzerland. Also that year, the city’s design was voted "Sustainable Region / City of the Year" at Euromoney and Ernst & Young’s Global Renewable Energy Awards. Once fully built, Renewable Energy will be a power source in Masdar City, and solar power will meet the vast portion of the renewable energy mix, where the city’s power needs are estimated at 230MW. This is a substantially lower energy requirement than that of comparable conventional cities in the region. A great deal of electricity can be generated from solar sources, including photovoltaic (PV) and concentrated solar power, reducing the city’s power demand that will help achieve the city’s sustainability goals.. The city will minimise energy demand by deploying the most energy-efficient techniques available. This includes setting building codes that far exceed those of any existing rating system, installing smart appliances and utility networks that interact to reduce appliance demand during peak consumption periods, and using passive architecture features that increase shade and reduce solar gain, and cutting edge cooling technologies. In addition to solar energy, Masdar City is exploring the viability of geothermal, waste-to-energy and solar cooling technologies that use the power of the sun to run air-conditioning units. was connected to the Abu Dhabi power grid in April 2010 and is supplied by 50 percent thin film photovoltaic modules and 50 percent polycrystalline photovoltaic modules. Once fully built, Masdar City’s water needs will be less than half that of conventional cities in the region. It will require around 12,500 m3 per day of desalinated potable water. To achieve this the city will use a broad array of water use reduction technologies, including high efficiency appliances, water tariff that promotes water efficiency, smart water meters that inform consumers of their consumption, treated wastewater recycling, and high efficiency irrigation and low water use landscaping. Masdar City will also severely diminish the landfill area needed by developing systems and encouraging lifestyles that will dramatically reduce waste. It will provide an environment that enables a low-waste lifestyle through the reduction, reuse, recycling and recovery of waste materials. A vacuum waste collection system will allow residents to easily separate their waste, facilitating a high recycling rate. Most waste that cannot be recycled will be treated in a thermal treatment plant, from which energy will be generated. 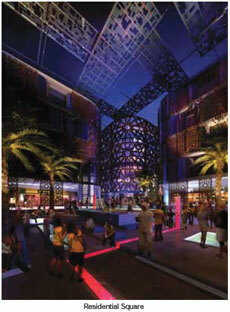 Masdar City will be the first modern city to operate without fossil fuelled automobiles and trucks at a street level. The design of the city will allow individuals to live and work without the need for a personal vehicle. As a pilot in the Masdar Institute neighbourhood, Masdar City is deploying the revolutionary Personal Rapid Transit (PRT) and the Freight Rapid Transit (FRT) systems that, together with pedestrian and other public transit methods, will safely move people and goods across the city. PRT vehicles are similar to unmanned taxicabs, in size and comfort, guided by a central computer that controls the movement of all PRT and FRT vehicles. The goal is that people within Masdar City will not have to walk more than 250m to get reach some form of public transport. Masdar City is an "emerging project" within the One Planet Living programme - a global initiative developed by WWF (also known as the World Wide Fund for Nature and the World Wildlife Fund) and BioRegional - that aims to show that it is possible to live within ecological limits and still improve the quality of people’s lives. To guide these efforts, One Planet Living has created 10 principles to which sustainable communities should adhere. BioRegional helped develop Masdar City’s Sustainability Action Plan in order for the city to be endorsed as a One Planet Living community. The first building to be operational at Masdar City will be that of the Masdar Institute of Science and Technology, whose students will be the first residents of the city. Focused on the science and engineering of advanced alternative energy, environmental technologies and sustainability, Masdar Institute will be at the heart of the homegrown research and development community at Masdar City and will eventually host up to 600-800 Master’s and PhD students and more than 100-150 faculty. Foster + Partners, which developed the city’s master plan, has designed the Masdar Institute building, a complex structure that encompasses labs, student residences, classrooms and offices. It is designed to use 70 percent less electricity and drinking water than conventional buildings of its size and is wired throughout with an energy metering system that monitors energy consumption and produces data that will be easily accessible to students and faculty for use as a research tool. The building will be a test bed for sustainable technologies that will be studied and refined for implementation in future city buildings. - will locate its headquarters at Masdar City, bringing to the city the latest in renewable energy policymaking, global best practices and state-ofthe-art technological expertise. This is the first time an international organisation of such size has selected a Middle East city for its secretariat. IRENA was founded in January 2010 and has 143 signatory countries from both the developing and developed world. IRENA aims at becoming the main driving force in promoting a rapid transition towards the widespread and sustainable use of renewable energy on a global scale. Acting as the global voice for renewable energies, IRENA will provide practical advice and support for both industrialised and developing countries, help them improve their regulatory frameworks and build capacity. The agency will facilitate access to all relevant information including reliable data on the potential of renewable energy, best practices.